Lisbon is a game about the reconstruction of the great Portuguese capital city after a series of terrible catastrophes. On November 1, 1755, Lisboa suffered an earthquake of an estimated magnitude of 8.5–9.0, followed by a devastating tsunami and 3 days of raging fires. The city was almost totally destroyed. Lisbon is thus played, in part, on a representational map of the city. During the planning of the downtown re-building project, the type of businesses permitted in each street was pre-determined. The clockmakers and goldsmiths had their street; as did the bookstores and libraries; the tailors and silk vendors; and the toolmakers as well. This all comes into play on the Lisboa gameboard. Lisboa Full Rules Video from Gaming Rules! At this point we all can see the kind of games that Vital Lacerda usually comes up with. Looking up His previous works in Kanban, CO2, Vinhos, The Gallerist and now Lisboa. Its a part of EGG Vital Lacerda KS series (The Gallerist, Vinhos and now Lisboa). The game still follows the same direction in terms of visual and presentation in the hand of Ian O’Toole. I love the artworks, no doubt. It shows a very strong characteristic visual presence of the Lisboa culture with the blue and white decorative patterns. Honestly, this is better than The Gallerist and Vinhos. The game is about rebuilding the city of Lisboa after the great disaster back in the day. Unlike The Gallerist which has worker placement mechanic, this game has a multi-use cards that combined with Hand management and tableau building to build up your engine. In the game you can do two things (like His other games, start with simple and few choices but branching out from there), either visit the nobles or trade with them (these 2 different actions can be done with a single type of card depends on what you do with it. If you trade with the nobles, you will use the card to improve your portfolio (place it on your player boards and it will gives you certain benefits (passive and immediate benefits) throughout the game as long as it stays on. Trade with the nobles also allows you to trade with the nobles with your available goods. Each noble (there are three nobles) presents 2 state actions. The builder can give you hire officials and buy blue prints. While the prime minister allows you to buy ships and produce goods. The King allows you to move the Cardinal and take a favor tile. Players may choose to trade two of these actions with goods under restriction one action max per turn. You can also sell goods instead taking all of the actions above. Sell goods require vacant slots on a ship (no matter who owns it). Players gain the money based on the specific value of that commodity at that time plus the modifier presented by the ship. It’s an easy way to get a lot of money. Another action is to visit the noble, where players must pay influence to play the card into the board and take the corresponding action related to the card. It it’s a character card, you take one state action of that character and take the character action. The builder can build stores, the prime minister can give you decree card for end game scoring, while the King allows you to open public building. Aside from the active player’s action, other players can also follow the action by spending a corresponding favor tile and spend influence to gain one of the three actions related to that character. Building is an important aspect in the game since the game is about rebuilding the city. Because of the disasters, the city is covered in rubbles (fire, tsunami and earthquake) that players need to remove in order to build the city. Players need to spend money to excavate the rubbles on the building site depending the state of rubble available on that place at that time. Brown rubble cost the most expensive money(3) because thematically speaking, it’s heavy. While Tsunami is the cheapest because it’s water form easy to remove. The more rubble you have on a building require you to pay more. When building you will get bonus from that space and a cube that you can place on your board to complete a rubble set (3 types of rubble) to unlock your warehouse and portfolio limitation. Once you set up store, you can produce goods. When you take the produce action, each store you have will produce one goods and then the value of each type of goods that produced will decrease one step, this is the commodity price and it would only decreased during the game and never increased. Thematic speaking, at the start of the game, where stores are destroyed, the commodity value is high, when newly built stores are opened up, the value will slowly decreased. Players also need to build Public Building to gain prestige depending where their stores are located and also rubble cubes on that location. To open a public building players need blueprints and a number of officials in the office. Once built, Public spaces will give points to the store owners that qualify the type of stores that the public building allows. Another thing that players can do is when playing an event card on the board and take the corresponding event bonus, this cannot be followed by other players. At the end of the turn, players will take another card from the display to refill their hand back to five. The game is broken down to 2 periods where at the end of the first period, players will get the rewards from the cards they decide to discard and score points for each rubble set they managed to clear. The game should be simple but the truth, there are many actions in the game that connected with others which brings very detailed and intricate flow of the game. Complexity is totally high and players must cover all of the details to start the game, they even get player reference in a menu-book like manner that compiles all the action details and descriptions of all the bonuses, effects and others. If you are not used to this kind of games, there will be hard times to adapt with how the game works and a lot of efforts to relate with all of the details. It’s intimidating of course, but once you get your head wrapped around the rules, it would really satisfying. If you are already familiar with His games, then this will be interesting game for you. I like how the decree cards will determine the end game scoring for each player differently and the actions they choose over the course of the game. Interactions are high because players compete the best building spots and commodity value. Building portfolios also important cause you will get a lot of benefits from it and clearing rubber set will expand the possibility to improve it. And what I like is that the portfolio is your tableau building but it’s not static, players can change their portfolio only by playing a card, so there’s a flexibility to some degree. The game definitely has high replay value. 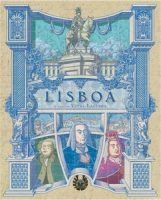 Add a Review for "Lisboa"